The Big Girl Room Makeover is complete. Well, there are a couple things I’d still like to find/do – I’ll fill you in on that – but it’s done enough to share with you. And I am really loving it. This is just going to be a big ol’ before and after post of photos. I started editing the 9,762 photos (ok, ok slight exaggeration) of all the little parts of the room and realized it would make one GINORMOUS post if I explained it all in one post. So every day this week (or at least until the topics run out!) I’m going to try and write a quick, detailed post on every part that makes up this room. So if you have any questions that aren’t answered in this post, chances are I’ll get to it at some point in the next few days! Let’s get to it, huh?! 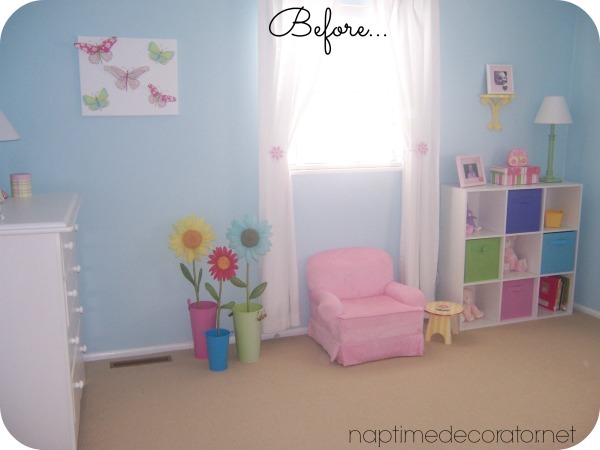 Since this barely two year old is now almost 9, this room was due for an update. Oh boy, was it ever. 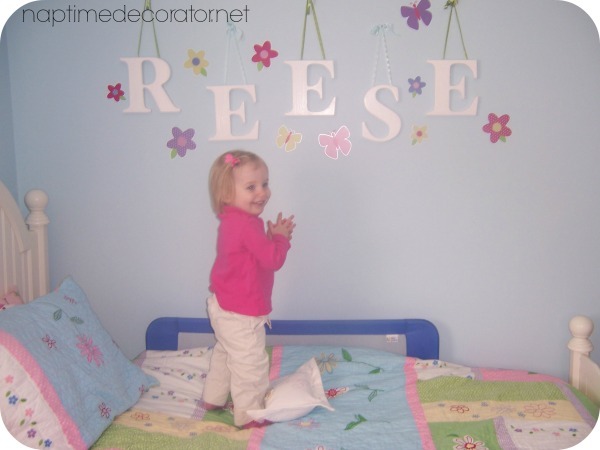 Since these early days, it had stickers stuck all over the wall, she needed a bigger dresser, that pink chair got so much love it was literally falling to pieces. She’s growing up so fast, and I wanted to give her a space that is a little more sophisticated, but still has a part of little girl in there. So I went with a minty green/coral/gold combination. It’s a beautiful mix, and that touch of sparkle from the gold is just perfect for my glitter-loving girl. 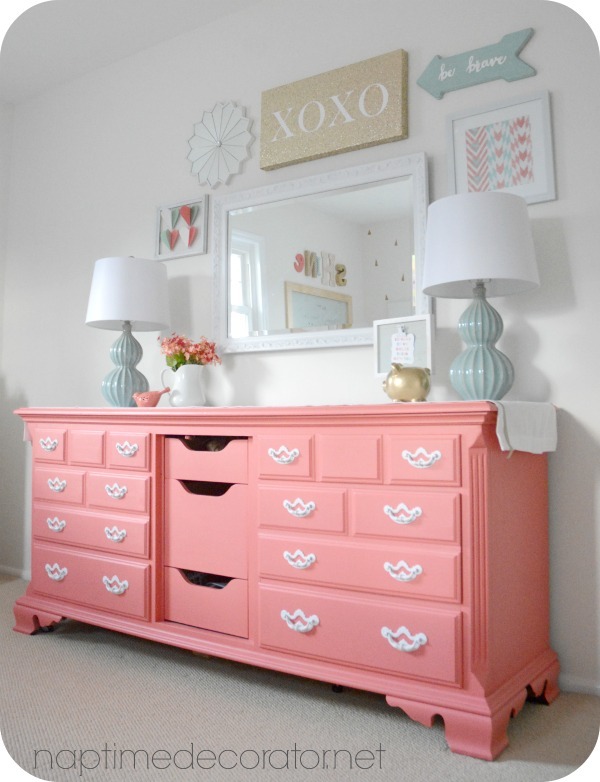 That dresser was really the inspiration for the entire room. I got it last year, and was just so wild about coral (still am!) that I picked up a sample of Sherwin Williams Begonia and painted it without even a slight vision for her room. When I saw it up against the blue walls at the time, I knew I had to go neutral on the walls for it to really look fantastic. 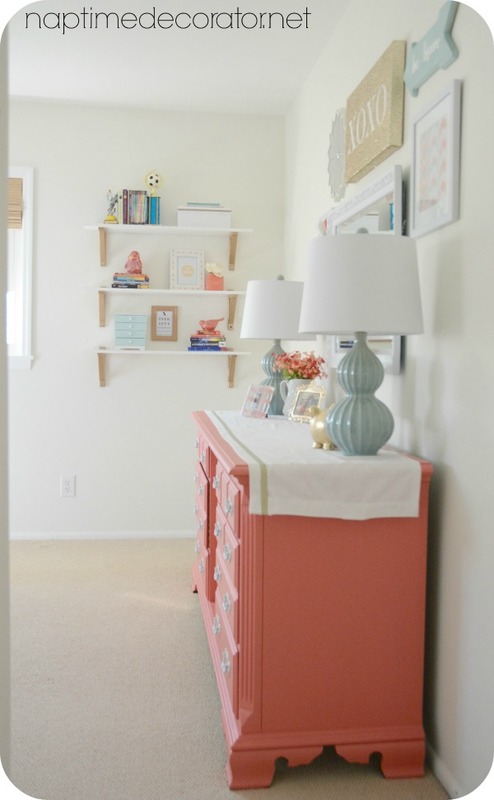 So I chose Alabaster by Sherwin Williams – a creamy white – and it was the perfect choice to make this dresser pop. 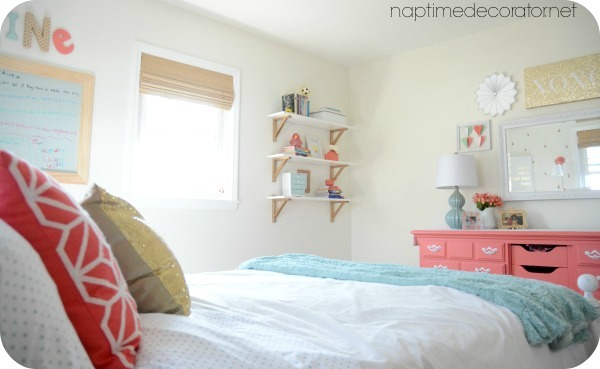 That patterned focal wall – with her bed…that ended up being a total fluke – but in a very good way! I’ll post that tomorrow. You won’t believe just how easy, quick, and inexpensive it was – but it packs such an awesome punch! 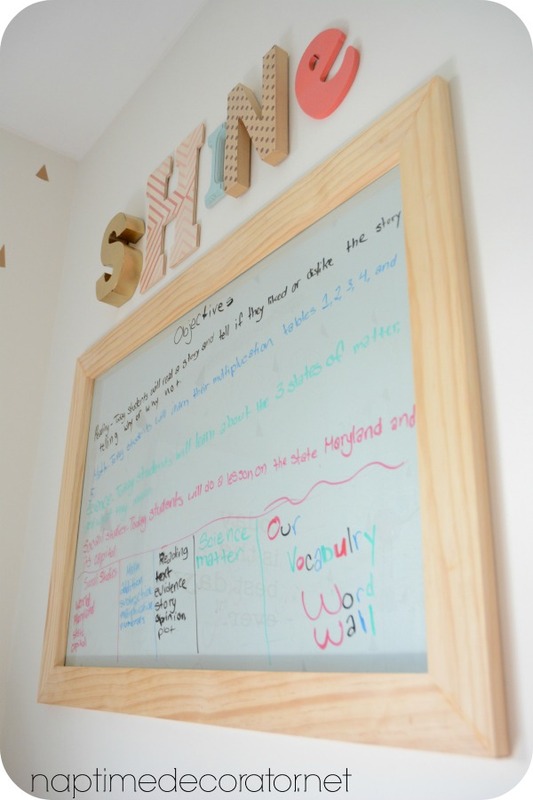 You’ll notice in that picture, I did another DIY dry erase board again, just like in her little sister’s room. I went with a stain instead of painting the trim though – the white just wouldn’t have popped against the color of the wall. 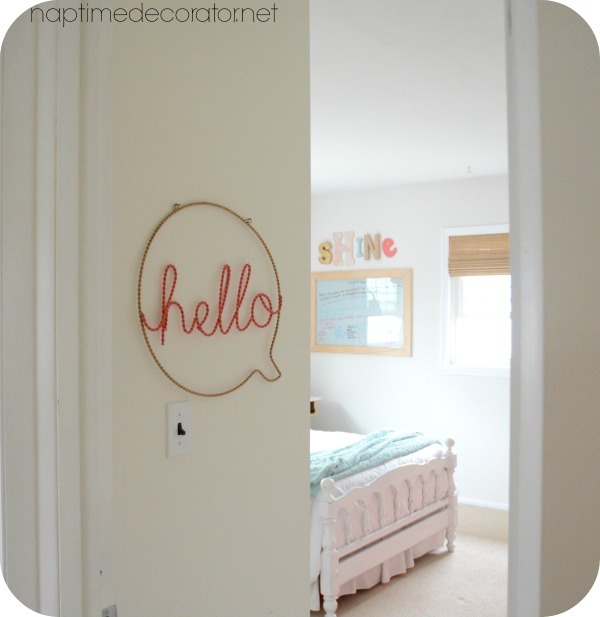 I’ll fill you in on that this week too, but in case you want to check it out when I did my other daughter’s room, here’s the post. The bed was a yard sale find (broken record: stay tuned this week for that post! Told you – it’s gonna be a week of back to back posts!) and I found THE PERFECT jersey sheets at Target with a minty green triangle pattern, echoing the walls. I was pumped about those. And the pillows are from Target (coral), HomeGoods (mint) and I found that glittery gold pillow cover for $4 at Hobby Lobby! The throw blanket is from Marshalls. And the comforter is just a plain white duvet cover from Target over a down comforter we already had. 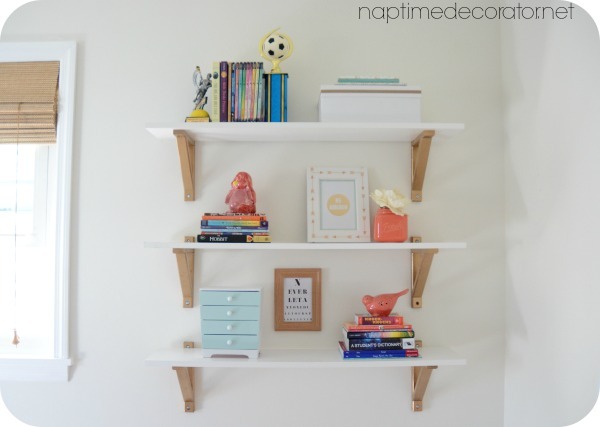 I decided to go with shelves instead of a bookcase, because the room was starting to look crowded…and I just think shelves couldn’t be more fun:) These are white premade shelves from Home Depot, and the brackets are natural ones from Ikea that I spray painted gold. 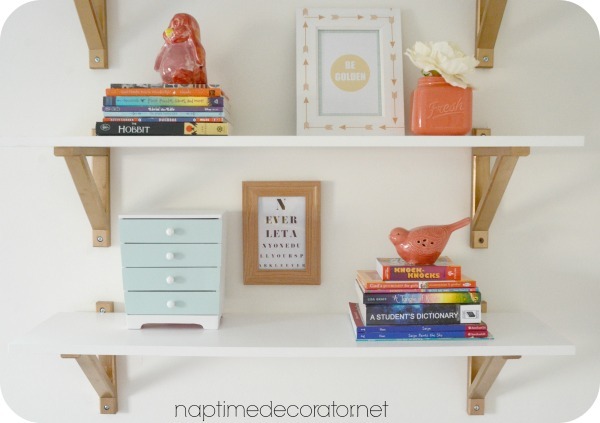 A girl’s gotta have a space for her trophys, books, and homemade pottery, right?! I found those cute cards at JoAnn Fabrics and framed them – one says Be Golden, and the other says Never let anyone steal your sparkle ever. Too cute, right? 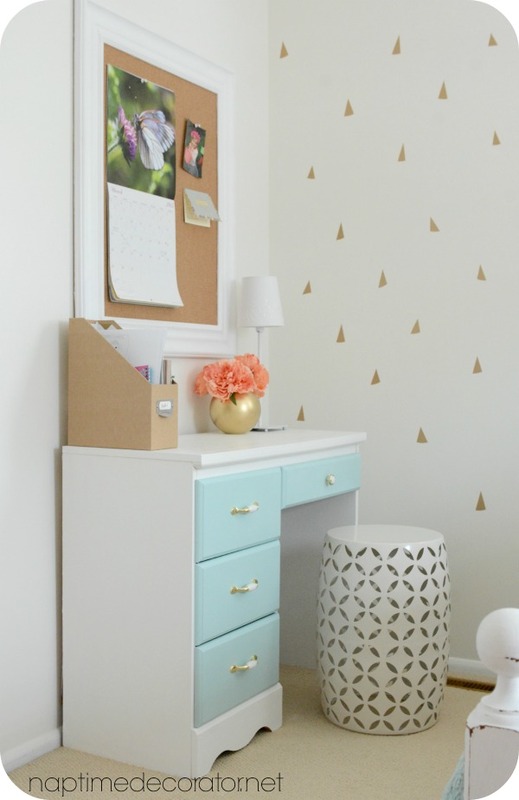 I also added that arrow washi tape to the Be Golden frame that I used on her $10 desk. Love that stuff! I was going to hang one or two more shelves, but I decided I’d really like to find an awesome comfy bean bag-or-something for that corner, and any more shelves wouldn’t offer any headroom. Just think it’d be a perfect hang out spot for when her friends come over. That’s one of the few things I still need to get that I mentioned in the beginning. Another thing I want is another larger area rug for the space in front of her dresser. I did score this cute chevron rug from Target in a jute/coral, and stuck it by her bed. I love how it ties in the natural element with the bamboo shades and brings some depth and color to the floor. Balances it all out. I mentioned it was getting tight in here, so that stool acts as both nightstand, and chair when she pulls it up to the desk right near her bed. In case you missed that makeover, here’s the desk post. A vintage-y wall clock for above that bulletin board, and new baseboards (GAH, darn you skinny 1960s baseboards!!) are the only thing left to perfect this room. I’ll keep you posted when those last few things get checked off the list! We framed out the closet and windows, and I chose a bamboo shade from the Home Decorator’s Collection at Home Depot, in Multi-Weave Natural. I’m obsessed with them. We couldn’t go a curtain route, because of where her bed is placed, and I love shades anyway. This particular finish/style is dreamy and makes it super cozy and dark when they’re pulled down. In case you missed the gallery wall post, you can check that out here. The big gold R is actually one of those paper mache deals from JoAnn Fabrics, and I spray painted it gold. I’m a sucker for big letters. Big letters and arrows. Go figure. Now, as much as I love this room during the day, I love it even more at night. If there’s one thing I know to be true, it’s how important lighting is to impact a space. 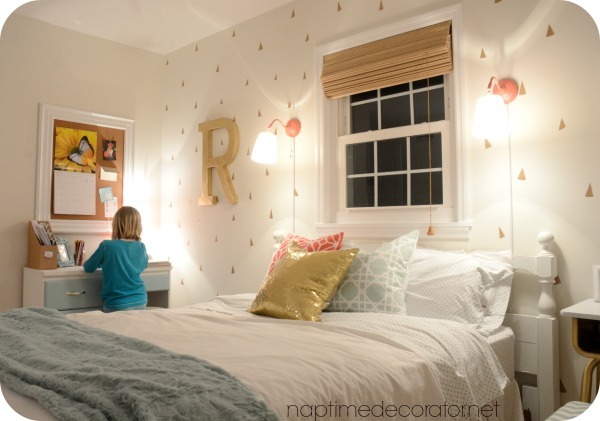 Wall lamps, cozy little desk lamps, big dresser ones – they’re all over the room and all of them make a big difference in changing the feel of this room at night. When I walk in and she’s working at her little desk with a few of the small lamps on…I just wanna jump in there and hang out all night long. I’m so pleased with how her Big Girl Room turned out. I feel like it’s suitable for a little girl, but she’ll also be able to grow with this room and it’ll still work when she’s a teenager. 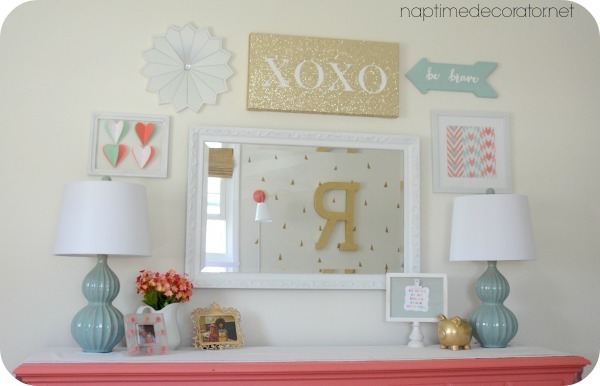 Love love love the room! It is perfect! So elegant but still young and fun. well done! Love it all!! How did you do the bulletin board? Thank you! That was from Marshalls – it was green originally, but I just painted the border white! 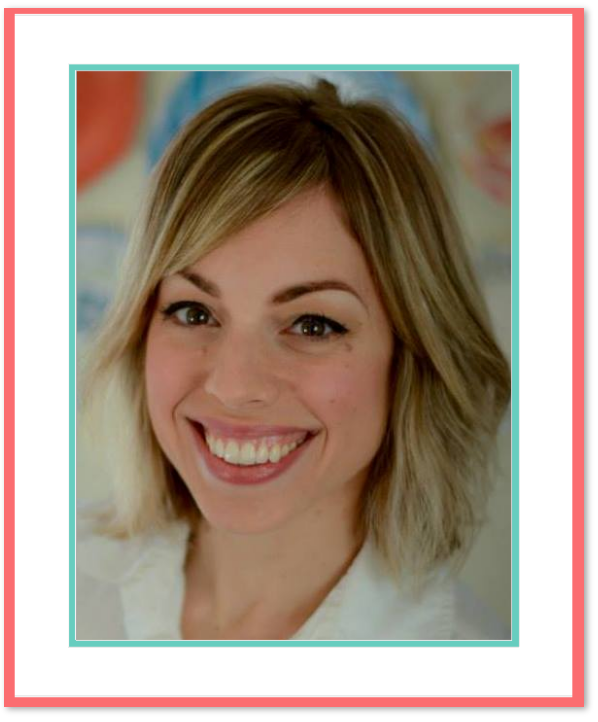 Great job Liz, as usual! I LOVE the sweet wall lamps & the color combination. 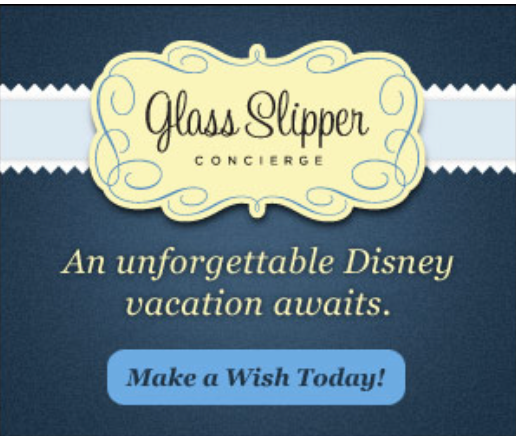 I have a daughter whose turning 10 in August & I’ve promised to makeover her room too. She loves that mint green too! I just moved my almost 2 year old into his big boy room in preparation for his baby brother’s arrival. 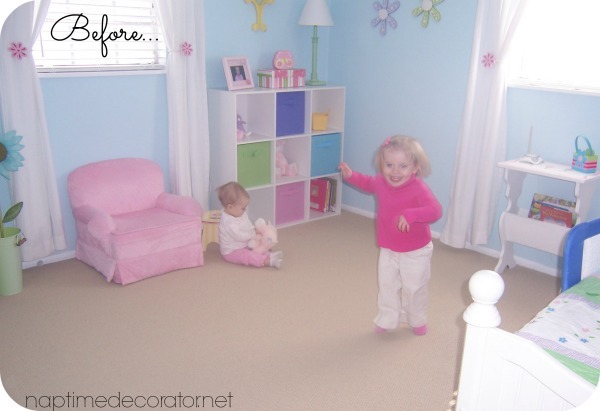 I cried at the end of your post because I can’t even imagine him being older and redoing the room again. Her room is absolutely beautiful! How old is your daughter? Love this room, my oldest is 8 and is still in her “little” girl room. She’ll be 9 in a few months. I adore this room, with all my heart! Just beautiful. My daughter loves coral and anything gold and sparkly. This is great inspiration. Where is the blanket from on the bed for that pop of color? Thank you! I got that at Marshalls. 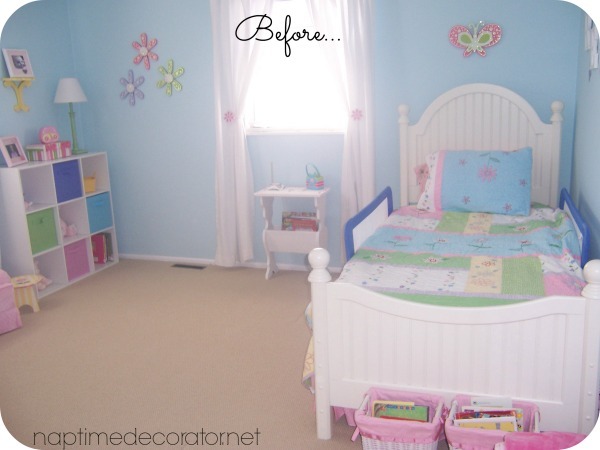 Love your daughter’s room makeover! 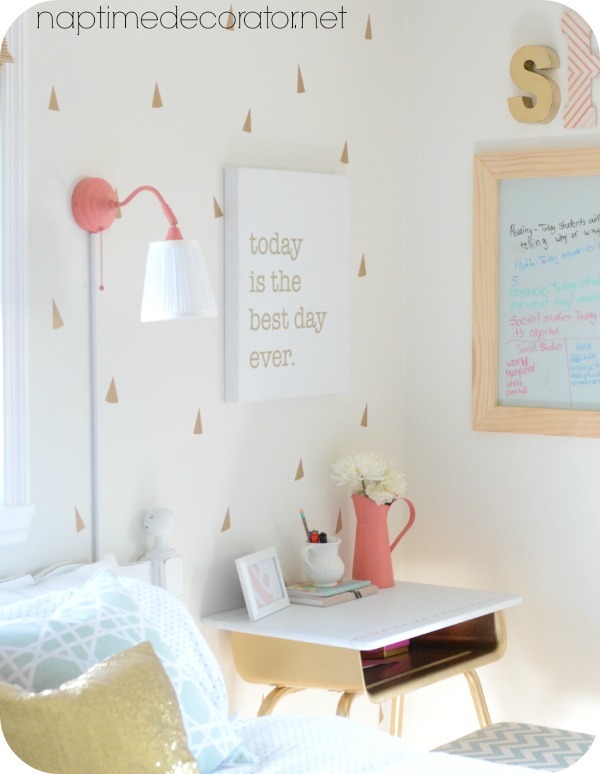 Our cute pushpins would be the perfect addition to her bulletin board! can you tell me where her initial R is from ? It’s a paper mache one from JoAnn Fabrics, and I spray painted it gold. It’s a garden stool from Lowes! 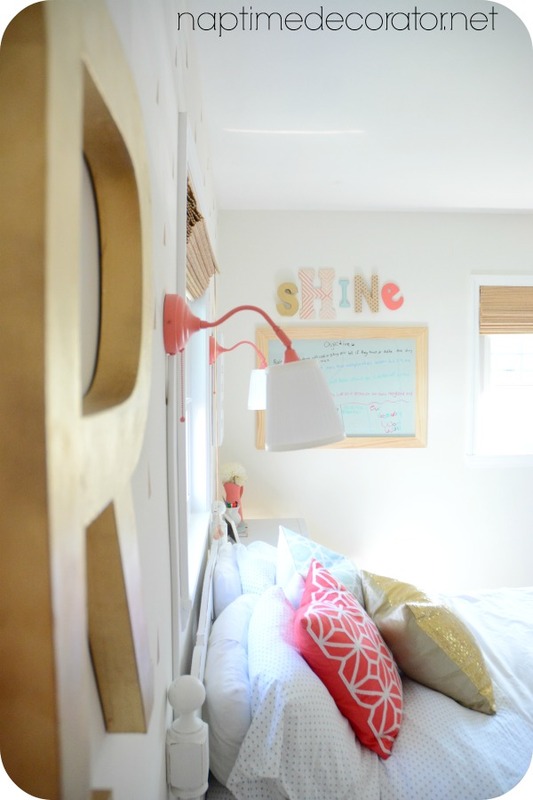 Can I ask where you got the adorable wall lamps from? Ikea! I spray painted them – they come in silver. Love the make over too. Congrats!!! 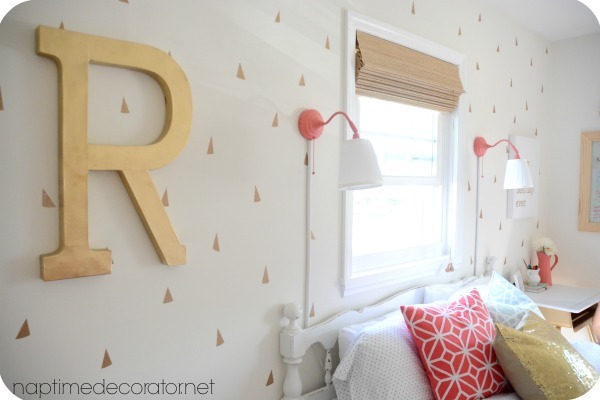 How did you do the gold wall stencil? thank you! They’re decal stickers. Where did you find that dresser?